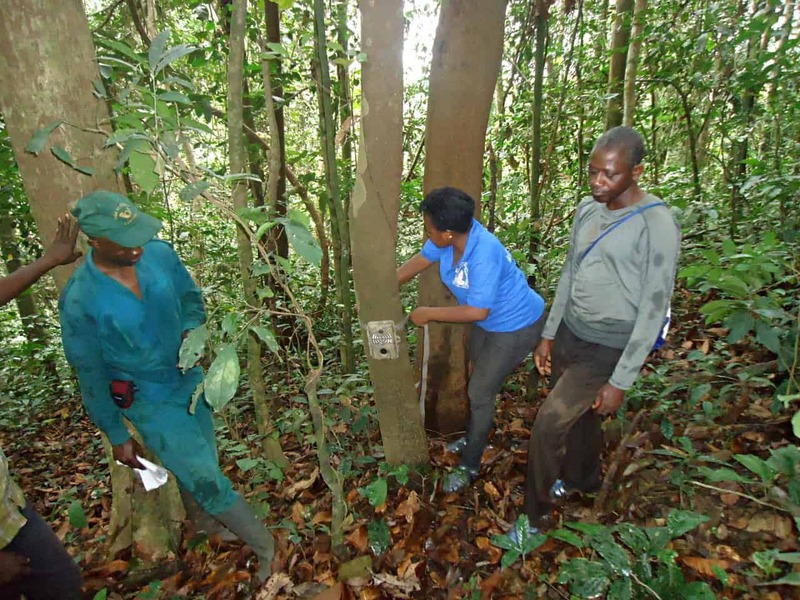 Exciting news, as an increasing number of Cameroon Nigeria Chimpanzees are being captured on camera traps in the Tofala Hill Wildlife Sanctuary. During the last survey in this sanctuary, a large group of 20 chimpanzees was caught on camera trap footage. Tofala Hill is situated in the highlands of South West Cameroon, a biodiversity hotspot that harbours unique but endangered species such as Cross River gorillas, chimpanzees, drill monkeys, forest elephants but also rare birds, amphibians and butterflies. The African Conservation Foundation (ACF) and Environment and Rural Development Foundation (ERuDeF), in collaboration with the Ministry of Forestry and Wildlife (MINFOF-Cameroon), have since 2004 been working together to secure the long-term survival of the last great apes populations in the Lebialem Highlands. This collaboration led to creating the Tofala Hill Wildlife Sanctuary in 2014, the creation of two out of the four ear-marked community forests in the Tofala-Mone Wildlife Corridor and is currently supporting the creation of the proposed Mak-Betchou Wildlife Sanctuary. The positive results of the camera trap monitoring programme, according to ERuDeF’s great apes researcher Gwendolyn Angwa, is an indication that the population of chimpanzee in the area is increasing. What is the common group size in this part of Cameroon and why? The number of chimpanzee is increasing as a result of increased birth rate. However, there is a possibility of influx from the Mone Forest Reserve through the Tofala Mone Corridor which is currently being developed. In addition, fusion of chimpanzee groups can occur in order to form larger groups when human encroachment reduced and there is high food availability. What was your motivation to become a conservationist and primatologist? “At the age of 23 after my degree in Zoology I could not find funding to further my studies. I decided to get involved in small trading to raise money to continue my studies. In 2013 I heard about biodiversity conservation for the first time and I decided to enroll in the Biodiversity Conservation post graduate program at the ERuDeF Institute in 2014. From the start, it was very challenging and frightful, hearing about sleeping in the forest and tracking wild animals. My passion for this field grew after my encounter with 8 chimpanzees on the first day of my trip on the International Volunteering program on Great apes in the Tofala Hill Wildlife Sanctuary in 2015. I became very excited and even more interested in conservation. 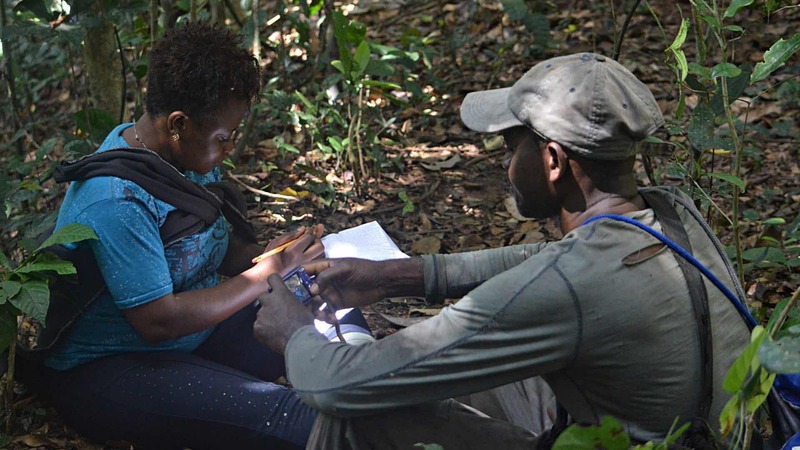 Great apes researcher Gwendolyn Angwa recording chimpanzee data in Tofala Hill Wildlife Sanctuary. Did you get involved in any research activities at that time? Will you expand your current research activities to other areas? Tofala Hill Wildlife Sanctuary has been official established in 2015. What are the conservation measures that have been taken in Tofala? We recruited and trained 6 hunters around the forest area to participate in forest surveillance and patrol. We converted them from hunters to conservationists. We also assisted all farm owners in the area to find other locations, outside the protected zone. We developed alternative sources of income with the local community members through training and by donating piglets and bee hives, as well as training women groups on soap and detergent production. Community and school conservation education programs have been conducted to educate the community and student on the importance of conservation. The continuous patrols and forest surveillance in the sanctuary, coupled with thorough community education on the importance of conserving endangered species and their habitat is starting to pay off. The patrols are carried out by both government and community rangers with supervision from ERuDeF Biologists or Wildlife Research Officers. 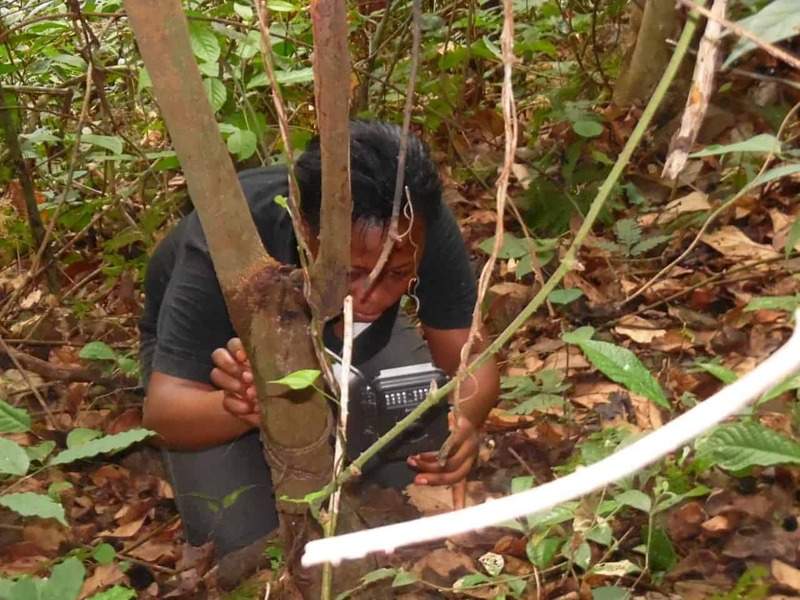 Gwendolyn Angwa installs a camera trap in Tofala Hill Wildlife Sanctuary. 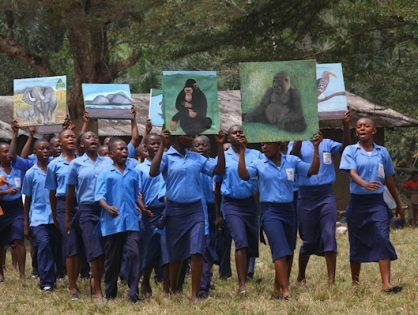 What are the communities’ attitudes towards gorillas and chimpanzees? Hunting gorillas and chimpanzee in communities around Tofala is a Taboo. According to their culture and traditions, these species are regarded as totem animals. Are there any human-wildlife conflicts, for example crop raiding? 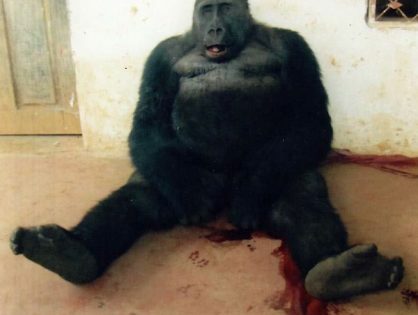 Yes, many cases of plantain destruction by Gorillas and chimpanzee have been recorded in the area. A positive side effect is that young people in the area are becoming interested in wildlife conservation. Gwendoline says she had three case of local volunteers joining the Biomonitoring Team during forest patrols. They are eager to join the conservation work. Is ecotourism playing any role in Tofala? Yes. 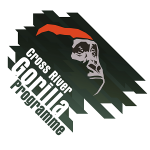 We have an international volunteering program that brings tourist who are interest in Apes conservation and Bird watching. What are the current obstacles for international ecotourism? The sociopolitical crisis in the region.